The DIEP flap is regarded today as the gold standard in own tissue breast reconstruction. 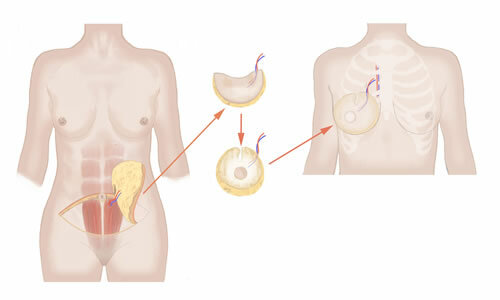 With the DIEP technique, skin and fat from the lower abdomen is removed, re-attached to the chest and shaped to reform the breast. Small blood vessels from this tissue are connected to blood vessels in the chest, just under the rib, using microsurgery techniques. There are certain types of free flaps where the underlying muscles are preserved when the tissue flap is removed. These are called perforator flaps. The DIEP flap is a perforator flap. The DIEP flap gives patients a shorter and easier recovery than the free TRAM flap, enabling them to maintain muscle strength. Which other flaps are perforator flaps? In addition to the DIEP flap, there are the SIEA, S-GAP, and I-GAP flaps. Risks of Surgery include: Bruising, swelling and discomfort. In rare cases, patients experience bleeding (haematoma), infection, failure of the flap (approx 2%), partial failure of flap, the need to re-operate (approx 8%), wound breakdown or necrosis of the mastectomy skin flaps. Problems occurring a week after the operation can include temporary reduced sensation of the abdominal wall and reduced sensation of reconstructed breast. Other (rare) problems can include scars – abdominal, umbilicus, breast unsightly, lumpy, stretch; seroma; and fat necrosis. Further Treatment: Visit to the Hospital Dressing Clinic (a week after discharge).